Many of us don’t spend time thinking about the quality of our pool water until the swimming pool becomes cloudy. When that happens, we look for a solution to the problem that can often be avoided with the proper maintenance of your swimming pool, spa or hot tub. Before I dive in any further, you need to know what water clarity is. Water clarification is defined as the removal of suspended particulate matter from swimming pools, spas and hot tubs. There are three reasons why water clarity is important. 1. Disease prevention: Cloudy water often contains viruses and bacteria which causes pinkeye, earaches and flu-like symptoms. Giardia and E. Coli (two of the most common bacteria) can cause diarrhea and even death in some cases. 2. Appearance: Cloudy, discolored and unsightly water makes swimming objectionable for many reasons. Would you want to swim in murky water? 3. Swimming safety: Accidents are likely to occur when swimmers entering the pool cannot see those already swimming. Worse yet, if someone is in trouble underwater and he or she can’t be seen due to cloudy water, the risk of drowning increases. Water clarity issues are handled through a combination of filtration and chemical treatment. Filters clarify water by removing particulate matter (such as dirt particles, skin flakes and algae) suspended in the water. Most particulate matters vary in micron size, and when it builds up, the pool water becomes cloudy. The type of pool or spa filter you will need depends solely on the type of pool you currently own. You also need to take a few other things into consideration as well, such as the type of problems you will need the filter to fix. Does your pool suffer from high levels of bacteria? Then the Watersafe Rapid Bacteria Pool Water Test will be best for you. 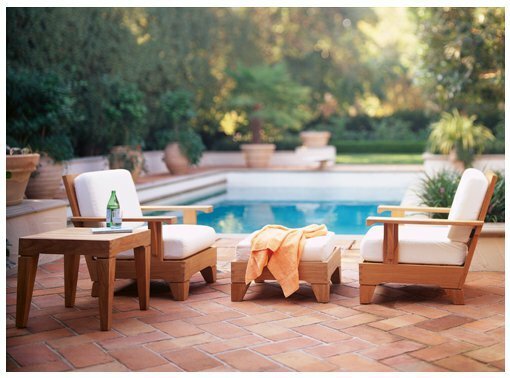 Are you unsure about the water quality in your pool, spa, or hot tub? 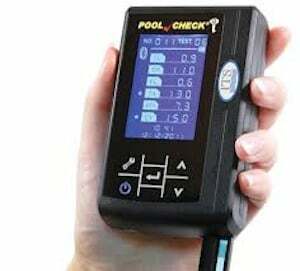 Then the Pool Water Check Meter (pictured above) is the perfect choice. This water testing meter checks the water quality in your pool and spa and includes a scanner and one bottle of test trips for your convenience. Regardless of the type of filter you use, the filter must be in proper working condition to ensure sparkling and clean water. If the filter wears out, the filter will lose its ability to properly grab the small particles. To maximize your filters effectiveness, regularly clean and replace the filter according to manufacturer’s specifications. If you are planning on going for a swim at a public swimming pool, keep in mind that most state health departments require that the main drain be visible from the pool deck at all times. If it is not clearly visible, do not get in. Enjoy the spring and summer months, you’ve earned it. Keeping a watchful eye on maintenance and the water quality in your pool, spa, or hot tub will benefit you in the long term. We’re always here to help and assist in any of your pool/spa filter needs. If you have any questions, concerns, or are in need of friendly advice, leave a comment and our in-house filter experts will be glad to help you out. One way to avoid cloudy swimming pool water is to let the swimmers take a shower before they actually dive into the pool. This is for sanitary purposes. Also, proper eductation and constant reminder for people regarding pool hygiene is necessary. Nobody wants to enter a murky pool so before our pools become even fuzzy looking, let’s take heed of the necesssary precautions. Of equal importance, the locker rooms should be clean, offer a safe place for your belongings and still have adequate shower facilities. If you’re only swimmer within the lane while another swimmer enters, it really is polite to select your side in the lane and turn into on it. This controls perfectly the proliferation of algae with your pond. Based on recommended heater temperatures and settings from practically all manufactures, the optimal range for both. Most pools may be found at hotels, massage parlors, schools, gymnasiums and also homes.